Entstehen und Vergehen: Werden aus dem Nichts bei Aristoteles? In De Generatione et Corruptione (GC) Aristotle distinguishes substantial change, i.e., a coming-to-be or a passing-away of a substance, from all other kinds of accidental change, such as qualitative change, growth and diminution, and locomotion. For all these latter kinds of accidental change, Aristotle explains that there is an underlying substance that persists while its properties undergo changes. But in the case of a substantial change, there is no underlying substance, and without an underlying substance, change cannot be understood. So we are faced with the following dilemma; either one reduces substantial change to merely a kind of accidental change, or else one meets the paradox of becoming out of nothing. It will be argued that Aristotle’s answer to this dilemma is to be found in the indissoluble coupling of a generation with a corresponding corruption. This will also shed new light on the question of prime matter. Can Aristotle’s prime mover be a physical cause? The paper examines Aristotle’s arguments for an unmoved mover in his Physics and Metaphysics. First, the question is raised whether it is legitimate to address this theological topic within the context of a scientific investigation of nature at all. The question presupposes, however, that physics can do without at least a theological perspective, and Aristotle argues that it cannot. In a second step, Aristotle’s arguments for an unmoved mover are reconstructed. One important result is that Aristotle cannot explain the nature of the first mover and the type of transcendent causality that is involved in a physical context because these questions are genuinely metaphysical. Therefore, the third step leads to Metaphysics Λ where both questions are answered. The paper closes with three points for further discussion: (1) Is Aristotle’s metaphysical conception of matter really sufficient? (2) Does his metaphysical theology rest on an entirely outdated physics? (3) What is the method that Aristotle employs in theological reasoning, and especially, how do his inferences towards the existence of a divine intellect work? The paper will attempt to show how Aristotle’s reflections can be used in rethinking the relationship between time and practical choice. The analysis will be divided into three parts: 1. an outline of the principal questions relating to time in Physics IV; 2. an analysis of the Aristotelian concept of time applied to human beings; and 3. the ethical implications that ensue. By looking at the Aristotelian interpretation of time in the Physics, we can formulate a new reflection on the present that can be a guide in practical choice and help us create a less alienating relationship with the present. Die vier Ursachen der Tugend? The paper discusses the question whether Aristotle’s concept of causality is applicable to the acquisition of virtues. It therefore connects Aristotle’s doctrine of the four causes, as it is developed in Physics II 3, with his account of the virtues elaborated in the Nicomachean Ethics. On the one hand, the doctrine of the four causes seems to be helpful when we want to understand the virtues since the acquisition of the virtues is a kind of transformation (kinêsis). On the other hand, however, the coming into existence of the virtues is not a transformation of the kind envisaged in the Physics since it has to do with voluntary acts rather than causal relations. It is for this reason mainly that it seems to be impossible to apply the doctrine of the four causes to the virtues. In the paper I argue that Aristotle’s concept of causality is applicable to the (acquisition of the) virtues. In order to show this, the concept of kinêsis is elucidated as a first step in order to see how the virtues can be related to it. In a second step, the doctrine of the four genera of causes is explained and some pros and cons of understanding the becoming of a virtuous person in terms of the four causes are presented. As the third and final step the paper points at some advantages of applying the four causes to the (acquisition of) virtues and thereby emphasizes the necessity of elucidating the complex nature of human beings from the perspective of both ethics and natural philosophy. Aristotle has developed a systematical analysis of modal concepts («necessary», «possible», «impossible», «contingent»). 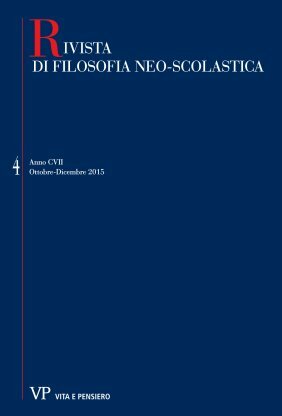 My paper aims at focusing on some main features of the «ontological rooting» of possibility within the framework of Aristotle’s study of the physical being – otherwise stated, the ways of a «modal definition» of the fundamental concepts whereby Aristotle thinks the physical world. The first section tackles the way of an interpretation of possibility as the central aspect of the natural world subject to movement. The complex relationship between possibility and contingency is also at stake and brings to the second section, whose main theme is temporality as long as it expresses the essential constitution of the moving being, i.e. of possibility (and contingency) as opposed to the necessity of the eternal. Aristotle’s considerations on the (ontological/metaphysical) constitution of the physical world underlie pivotal moments of his ethics, to which I constantly take reference as long as they show the innermost coherence of the Aristotelian thought. The article aims at a comprehensive account of the Aristotelian notion of matter (hyle). It is argued that, contrary to prevailing opinion, the notion accords well with contemporary physical and chemical theories of matter. The identification between Nature and Fate is one of the most important issues in which Aristotle’s Physics has been involved by late antiquity philosophers. My purpose is to prove that the Aristotelian occurrences about the structure for the most part of natural ordering influenced Alexander of Aphrodisias’ conception about freedom and his antideterministic polemics. According to Alexander’s De fato, violations of the necessary arrangement of Nature exist both for physical nature and human behaviours; so, against the Stoics the individual assent is not the logical outcome of a mental habitus in a rational kosmos. Free will entails the capacity of keeping the conditioning of our fate (habits, teachings, past experiences) at a distance. This is the only way we may actually be principle and cause for ourselves because of the features of our acts predetermined not fatally but for the most part. The Commentary on Aristotle’s Physics, wrote by Giordano Bruno, is extremely important to understand Author’s Anti-Aristotelianism. Focusing on the concept of physis, we aim to identify the originality of Bruno’s interpretation about Aristotle’s natural philosophy and the Neoplatonic sources of it. Bruno assumes the Aristotelian theory of the four causes, asserting that nature is principle, purpose, mover and element of all things. In particular, it is material principle, immanent to generated beings. Despite the Aristotelian background of Bruno’s discussion, his peculiar approach consists in defining matter and form as the two species of the nature and in asserting the ontological primacy of matters against form. In fact, since matter is absolute potentiality and actuality, it is not different from the form; as a consequence, matter does not become divine by mean of an external efficient cause, but matter is divine as such. A new conception of matter and of its elementary constituents, as well as a new idea of space and time, made seventeenth-century natural philosophy a markedly anti-Aristotelian science: the main theses of Aristotle’s Physica were refuted by the exponents of the ‘New Philosophy’, who rejected the speculative approach to the discipline typical of universities preferring experiment and observation. John Locke’s schemes of Physica (1670-1687) represent a privileged observatory for examining the attitude which the foremost exponents of the ‘New Philosophy’ adopted towards Aristotle’s Physica, an attitude expressing both the difficulty of rejecting the influential model totally and the desire to devise a new physica generalis, replacing the Aristotelian one. The peculiarity of Locke’s approach to this task consists in his adhesion to pansophia, and in his consequent reinterpretation of physica generalis as a universal sapientia encompassing all theoretical disciplines. In this paper the author aims to underline some common elements in Aristotelian and Spinozian philosophies, which, although in different contexts and words, show a substantial affinity, both in the approach to some questions and in the problematic outcome on these issues. Specifically, the author focuses on the conception of nature and on the relationship between nature and movement in the two philosophical systems and shows that both Aristotle and Spinoza, in order to determine the movement and to allow the passage from what moves and what is moved, necessarily presuppose a principle of activity, internal to the nature. On this principle, coeternal to nature, both the systems are not adequately focused: in Aristotelian philosophy, it is ‘hidden’ behind the difficulty expressing it in explaining the motion and the process of causation; in the Spinozian one, it is implicitly affirmed in the conception of motus as immediate infinitive mode. Hence the same difficulty in proving of the origin of the movement. Pierre Ceffons of Clairvaux, a relatively unknown philosopher of the mid-XIV century (little studied by Damasus Trapp, Amos Corbini and Christopher Schabel), is far from being irrelevant in the general economy of late scholasticism. This cistercian Master, whose Sentence Commentary dates from 1348-1349, is one of the first Masters to strongly react towards the significabilia complexe’s doctrine. In his quaestion 25 on the first book of Sentences, whose edition is here offered – implicitly using most of the material coming from John of Mirecourt’s quaestio 7 on the first book of Sentences – explicitly attacks Gregory of Rimini’s theory of significabile complexe, focusing particularly on the problem of the metaphysical consistence of those significabilia complexe. The result is one of the first attempt to criticize the theologically-impossible-to-admit significabile complexe’s consistency and its dangerous attitude to become an aeternal entity distinct from God, trying to get back to a more usual propositional-truth contest.